FULL RENOVATION, ALTERATION, RESTORATION & EXTENSION. ORIGINAL GARDENER’S COTTAGE BUILT CIRCA 1850, EXTENSION BUILT LATE 20TH C DEMOLISHED & REPLACED WITH A NEW EXTENSION WITH CATHEDRAL CEILING. NEW JOINERY & FITTINGS THROUGHOUT. 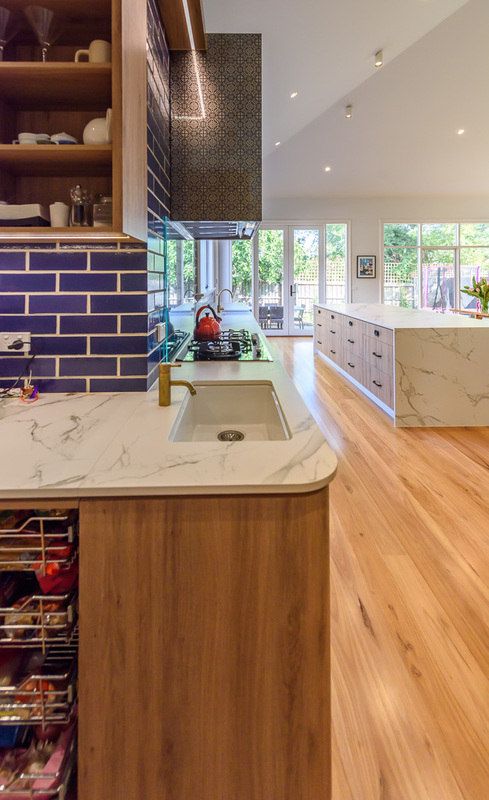 WE RETAINED AS MUCH OF THE CLIENT’S FURNITURE & ARTWORK AS POSSIBLE, FINDING NEW HOMES FOR MUCH-LOVED TREASURES IN THIS BAYSIDE HOME FOR A YOUNG FAMILY. Originally built as a gardener’s cottage in the 1850s, this timber block & weatherboard home had been extended in the 1980s, but was badly in need of new love and care to bring it back to life whilst celebrating its fabulous origins. Working with Genjusho builders, we demolished the poky, ad-hoc 1980s extension and replaced it with a daylight-drenched new family living wing. 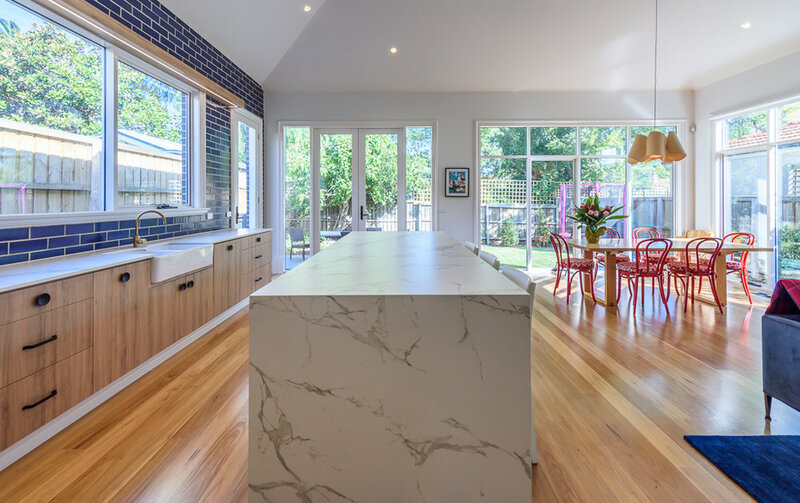 With soaring cathedral ceilings and large windows which bring sunlight deep into the cottage, this area now glows with light and is the heart and soul of this happy young-family home. 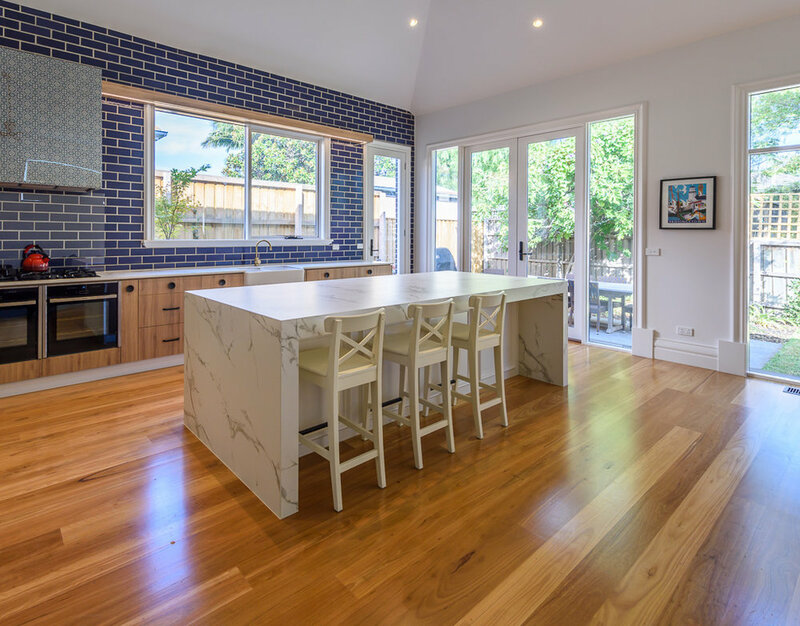 The kitchen is a large working space, designed for both leisurely pancake breakfasts on the weekend and busy weeknight family dinners - with a butler’s pantry tucked neatly around the corner to house further storage. The original rooms of the cottage were restored and repaired, while new rooms included a family bathroom, powder room, ensuite, WIR, laundry and dedicated study. Existing furniture was re-worked into the home, and the client’s love of blue, white and red was honoured in touches throughout the spaces, giving the cottage a very friendly and welcoming atmosphere. As a regular family gathering spot each weekend, pancakes are served on this polished Spanish porcelain island bench - making it an easy-care and easy to clean, yet still decidedly glamorous, spot to be. The cottage was originally built with timber blocks carved to look like brick, in a style used during the gold rush era in Melbourne as demand for housing soared with a rapidly growing population. We played with the idea of materials being not quite what they seem, introducing glazed blue bricks into the new addition. At first glance, the wall appears to be faced with cobalt blue tiles. But on closer inspection they are actually blue-glazed bricks which form the wall itself. Weatherboards are a repeated element, while the masonry brick wall on the side references the faux brick timber blocks on the original cottage facade. 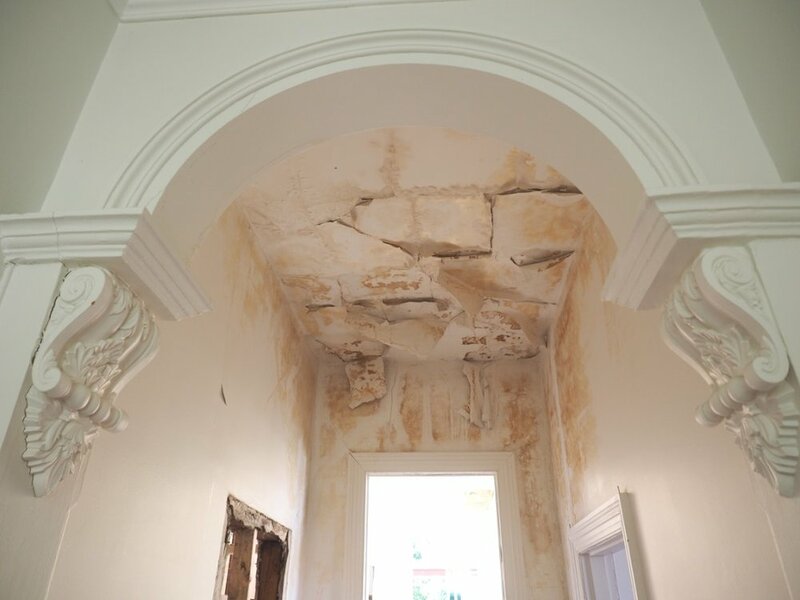 There was some serious repair work done to this cottage as part of our preparation for the new fitout. The original cottage is almost 160 years old, so it was an honour to work on a building that could tell a few stories of its own. Original elements were retained and repaired, while new areas incorporated a contemporary interpretation of mid Victorian style. The result is a vibrant family house, ready to create new stories for the happy family who now call it home.